The magnetoelastic effect—the change of magnetic properties caused by the elastic deformation of a magnetic material—has been proposed as an alternative approach to magnetic fields for the low-power control of magnetization states of nanoelements since it avoids charge currents, which entail ohmic losses. Here, we have studied the effect of dynamic strain accompanying a surface acoustic wave on magnetic nanostructures in thermal equilibrium. 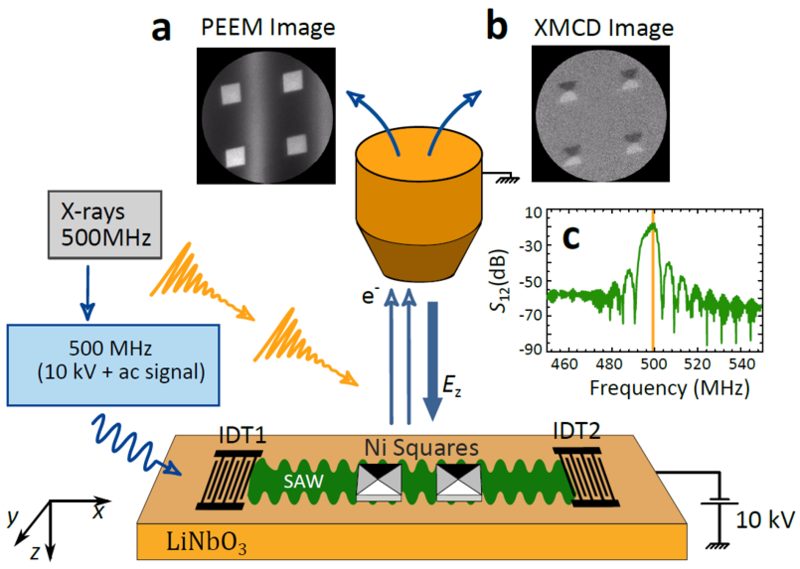 We have developed an experimental technique based on stroboscopic X-ray microscopy that provides a pathway to the quantitative study of strain waves and magnetization at the nanoscale. We have simultaneously imaged the evolution of both strain and magnetization dynamics of nanostructures at the picosecond time scale and found that magnetization modes have a delayed response to the strain modes, adjustable by the magnetic domain configuration. Our results provide fundamental insight into magnetoelastic coupling in nanostructures and have implications for the design of strain-controlled magnetostrictive nano-devices.